I recently got an email from a friend who had been given a denim trench coat, but had no idea how to style it. She told me that she was unsure what to put under it, and if I had any ideas. So, here are a few style suggestions for a Denim trench coat. My dear friend is quite a girly girl, and loves to wear vintage-style dresses with really full skirts. I thought that the denim coat would go perfectly over a pretty floral sundress and cute mary-jane heels. My friend is quite petite, and I would probably reccommend wearing heels with this coat, to add length to her frame and avoid getting swamped by the coat. I would avoid wearing jeans with a denim coat, to avoid the “denim tracksuit’ look. Instead, pair the coat with a pair of smart tailored pants and a fitted shirt or jumper for a look that is sophisticated and polished. A scarf is a great way to dress up a casual coat, and you can add different scarves to completely change the look of a basic item. Dark denim looks great with rich jewel tones, like ruby, emerald or amethyst. 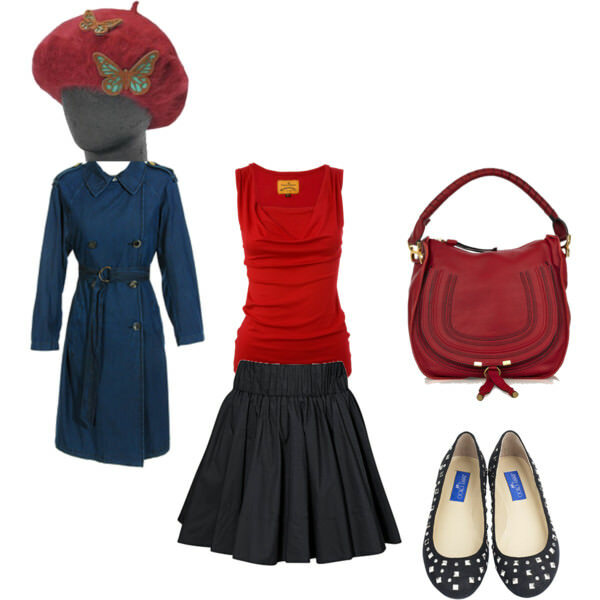 Pair a simple skirt and blouse with cute ballet flats and a sweet beret for a look that is a little Audrey Hepburn and a little Amelie. For a slightly dressier look, one needs simply to add spiffy, unique accessories. Brooches are an excellent way to add interest to a plain jacket or dress. Pin a single statement brooch onto the collar or use several small brooches to create a sparkly cluster. 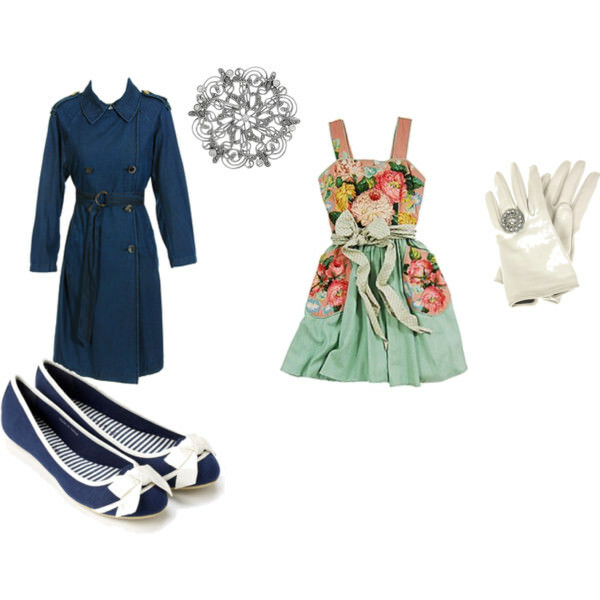 Teaming the coat with a gorgeous floral dress and a pair of prim gloves gives a modern item a vintage spin. Trench coats look fantastic with boots of all kinds, but I thought that these mahogany leather boots were the perfect compliment to the denim. Use denim to brighten a neutral colour palette, and keep you accessories in the same colour family for a clean, sophisticated look. My friend is a big fan of the Japanese Harijuku style, and this outfit is a nod to that crazy method of dressing. Everything is sweet, massively quirky and perfectly matched. Somehow, all these items that are wildly different styles look brilliant when mixed together. 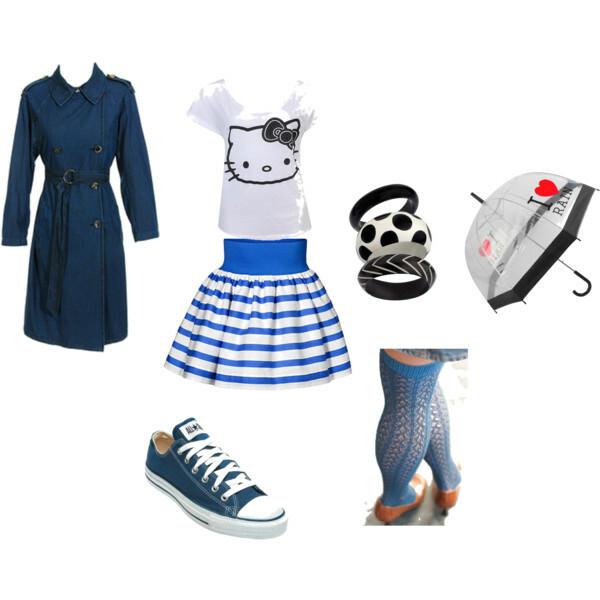 Simply grab a print tee, plastic jewelry, unique legwear and bright sneakers and always top it off with a brilliant umbrella. Mix and match textures and fabrics and keep a fun vein running through your sartorial expression. Denim is a great ingredient in bohemian outfits, and looks brilliant when contrasted with leather and floaty fabrics. Apply a liberal dose of mismayched jewellery and cap it off with pair of strappy sandals or heels. So there you have it. Hopefully this will get the brain juices flowing and inspire plenty of awesome outfits. Previous Daily outfit: Happy Australia Day!